Electrical stimulation therapy (EST) involves placing electrodes at the site of fracture and applying small voltage to enable quicker bone healing, however, this technique faces limitations of bacterial infection/inflammation. A simple solution could be delivering drugs locally at the site of trauma while enabling EST, from the surface of tiny and minimally invasive drug eluting bone implant. Hereby we demonstrate the ability of nano-engineered Ti bone implants in the form of tiny wires with Ti nanotubes preloaded with drug, for combined EST and drug releasing abilities. Authors: Gulati, K., Maher, S., Chandrasekaran, S., Findlay, D.M., Losic, D.
Optical rugate filters based on nanoporous anodic alumina are produced and precisely engineered by sinusoidal pulse anodisation (i.e. electrochemical oxidation) of aluminium foils. These photonic structures can be used for developing high throughput label-free molecular screening and sensing applications, encoding platforms of information as photonic tags and tracers and self-reporting drug releasing micro-sized containers. 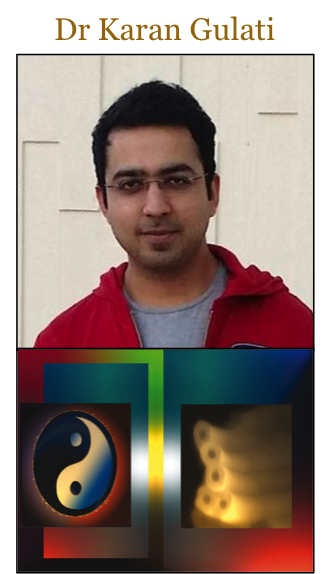 Authors: Santos, A., Yoo, J.H., Rohatgi, C.V., Kumeria, T., Wang, Y., Losic, D.
The 9th Conference on Optics, Atoms and Laser Applications (KOALA) and International OSA Network of Students (IONS) event will be co-hosted by students from Monash and Swinburne Universities in Melbourne from Sunday 27th November to Friday 2nd December 2016. 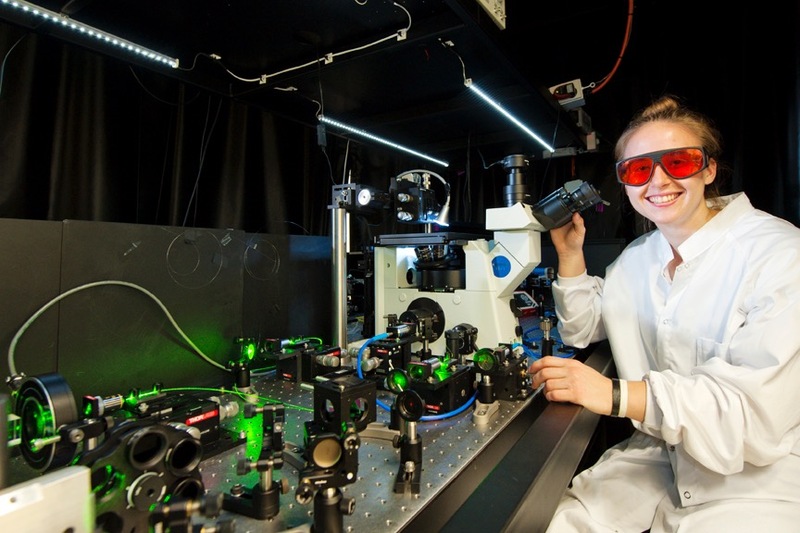 IONS KOALA is Australia and New Zealand’s only student conference in the fields of optics, quantum optics, atom optics, photonics and laser technology. For registrations and details, see their website, or email info@koala2016.com. Registrations close 14th October. Congratulations to IPAS researchers for gaining a spot in CSIRO ON Prime. This pre-accelerator program helps research teams validate their research and discover a real world application for it. ON embraces a get-out-of–the-building approach to learning, by encouraging hands-on, practical learning and business model development. The High Temperature Sensor, Sapphire Clock and Making better babies with light teams were successful in their applications and the research teams will head to Melbourne over the coming months to participate in the program. We also wish to congratulate the Robinson Institute for their successful application Home Fertility Assessment. 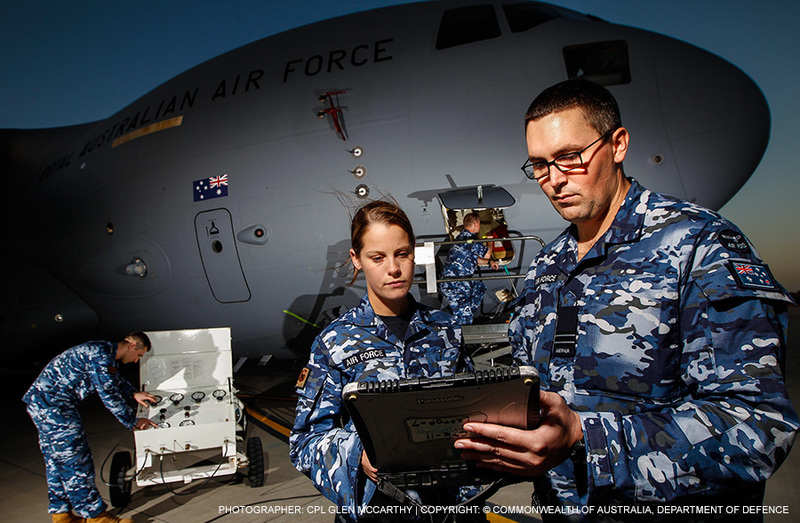 The days of Australia’s defence forces routinely deconstructing major equipment to visually inspect for corrosion could soon be over, saving huge amounts of time and money, and possibly even lives. In a world first, researchers at the Institute for Photonics and Advanced Sensing (IPAS), University of Adelaide have developed a unique form of optic fibre that can be coated with flurometric corrosion-sensing material—another world-first technique—and embedded throughout the critical structures of aircraft and ships. 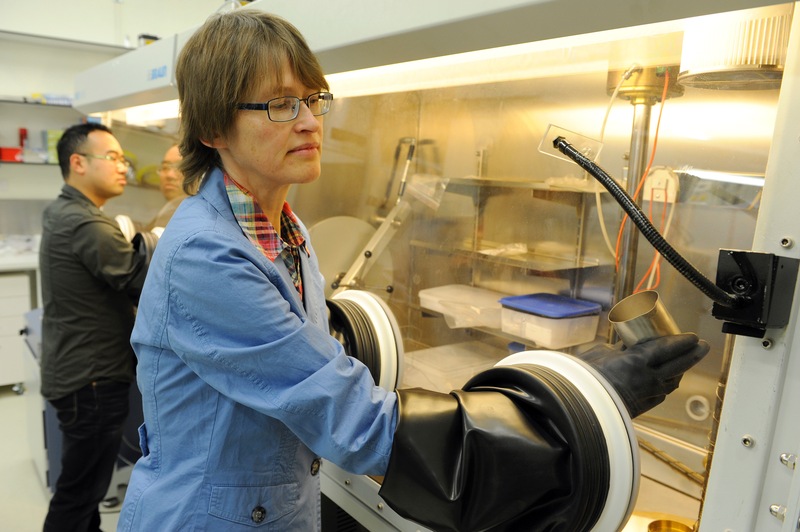 Co-lead researcher and IPAS Deputy Director Professor Heike Ebendorff-Heidepriem says this means a fighter jet’s wings, for example, could be checked for the early signs of corrosion in a matter of seconds, with no deconstruction required, then be immediately returned to action. 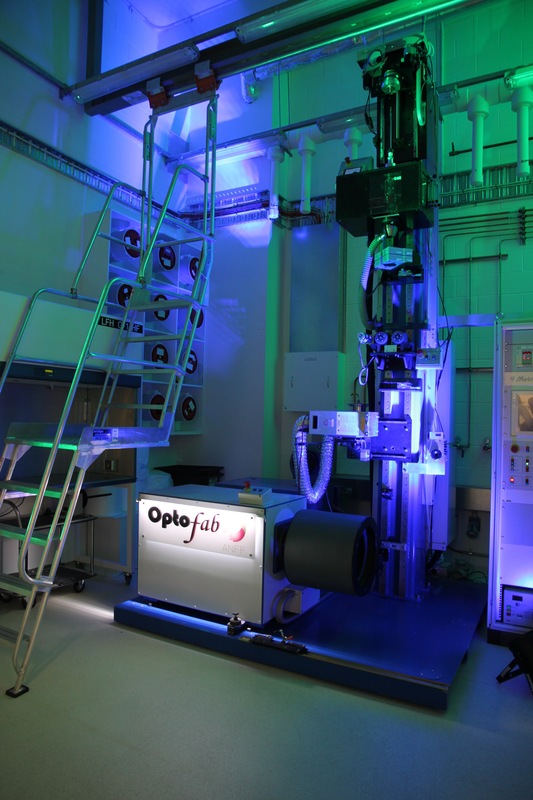 “We’d been working on training light along tiny ‘nano-rail’ fibres threaded through liquids, structures or other mediums as detectors for several years,” says Heike. “The light in the nano-rails isn’t contained, as it is in standard broadband-Internet optical fibres, but rather is guided along an exposed core, and can interact with surrounding materials to reveal their secrets. According to Heike, the breakthrough came when co-lead researcher Roman Kostecki developed the world’s first exposed-core optic fibre made from silica. The team subsequently developed a unique method of coating the fibres with chemicals that respond when light comes into contact with any nearby corrosion by-products, enabling near-instant checks to be conducted by firing lasers along the fibres. “We’ve already successfully checked for aluminium ions in aircraft-grade materials—the first time that’s ever been done with optical fibres—so we’re very excited to keep expanding the technique’s applications in conjunction with the DSTG. The technology has also led to new health-related research, says Heike, including in-vitro-fertilisation (IVF) and water-safety applications. 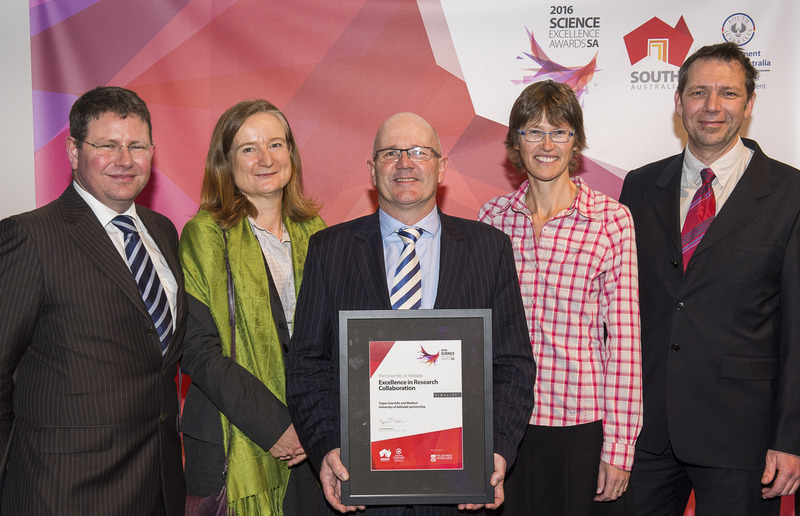 IPAS along with Trajan have been named finalist for Excellence in Research Collaboration award by the Government of South Australia. 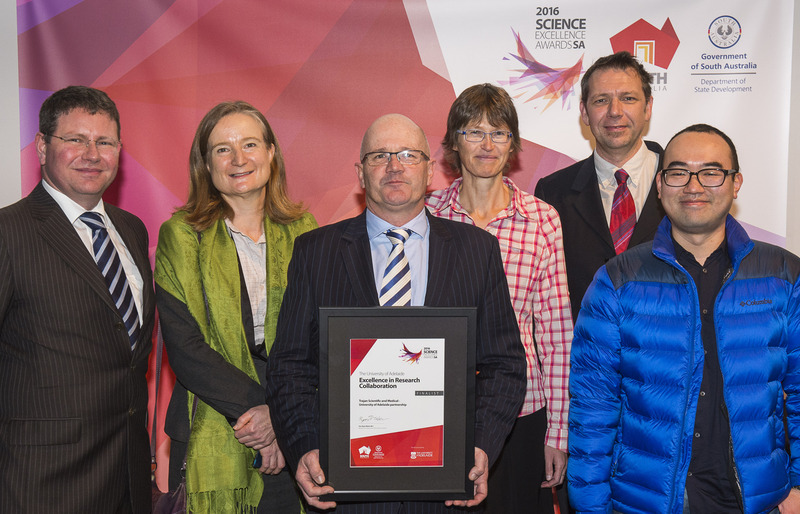 The Science Excellence Awards is South Australia’s premier event to recognise and reward outstanding scientific endeavour, including its application in industry and the advancement of science and mathematics education. 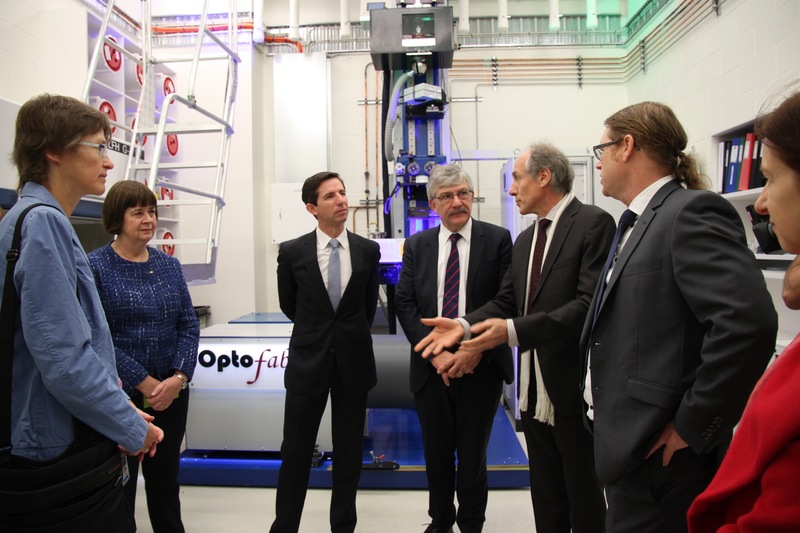 In November 2015, the University of Adelaide (UoA) commenced a major strategic partnership with Trajan Scientific and Medical (Trajan), with the support of the South Australian government, and launched the new Trajan R&D and Manufacturing Hub in Adelaide at the University. This collaboration is enabling the realisation of research, development and commercialisation of new generation specialty glass products for the global science and medical equipment market. The winner will be announced at the SA Science Excellence Awards Ceremony on Friday 12 August 2016. The Turnbull Government has announced an additional $16 million for 10 critical research projects that will generate meaningful social and economic benefits for all Australians in areas including urban infrastructure, bioscience, telecommunications and health. 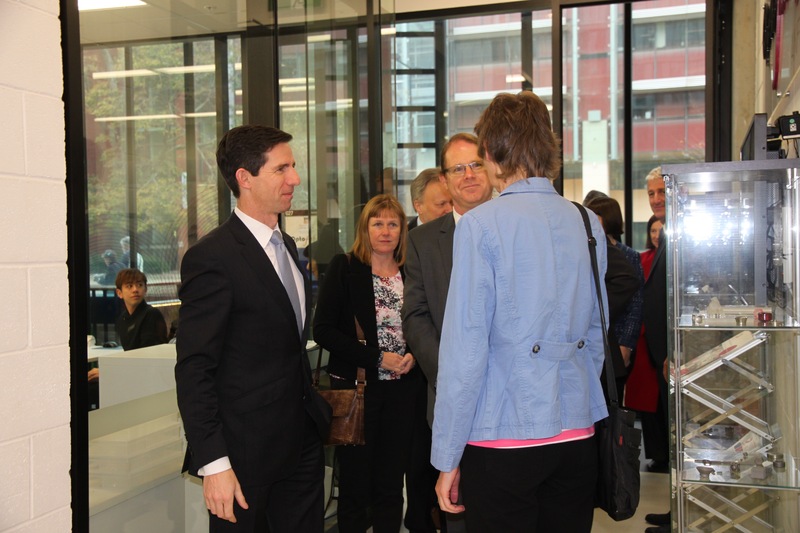 Minister for Education and Training Simon Birmingham said the investment from the National Collaborative Research Infrastructure Strategy (NCRIS) Agility Fund would help unlock Australia’s potential as an innovation nation by “backing work that offers real and tangible benefits for Australians from all walks of life”. “Homes, hospitals, farms and fishing trawlers are just some of the places set to see benefits from the research these new facilities will deliver,” Minister Birmingham said. “From areas as diverse as microscopy and marine science to ion acceleration and veterinary science, the Coalition’s $16 million additional investment in 10 research projects highlights our commitment to ensuring Australia has the support it needs for research and innovation. The additional $16 million funding comes on top of the $150 million of indexed investment for ongoing operations that we committed through the National Innovation and Science Agenda. Minister Birmingham said that the Coalition had taken an holistic approach to research by encouraging collaboration with industry and business to focus on being more responsive to the needs and priorities of our society and economy. “Australia needs a coordinated and focused approach to research priorities that are targeted at those things that make a difference to Australia and generate meaningful social and economic benefits,” Minister Birmingham said. “That’s why our National Innovation and Science Agenda outlined sharper incentives in research funding that reward research excellence and partnership with industry. 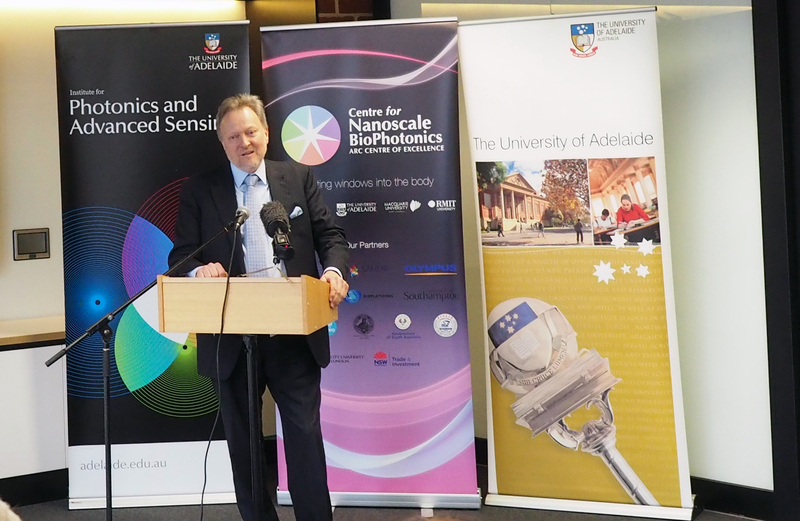 Minister Birmingham was joined at the announcement by the country’s Chief Scientist Dr Alan Finkel AO who was in Adelaide as part of a nationwide consultation trip to develop the priorities for Australian research. 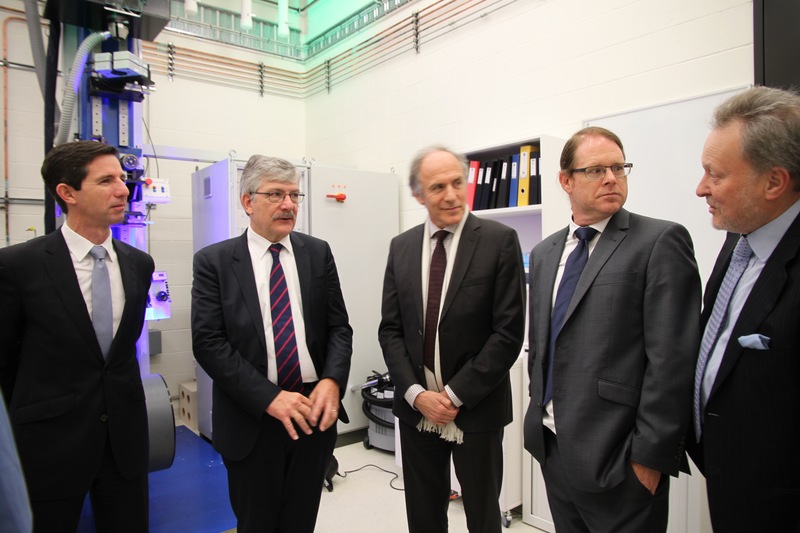 “The work Dr Finkel and his Expert Working Group of researchers, stakeholders and business leaders are doing is critically important to develop a new roadmap for NCRIS and direction for research and innovation for the next decade,” Minister Birmingham said. An optical fibre probe being developed by IPAS should improve the accuracy of breast cancer surgery and reduce the trauma for patients. Currently there is no reliable technique for assessing if tissue is healthy or cancerous during surgery, with many patients forced to endure a follow-up operation to remove tumour tissue that was missed. An IPAS research team is shedding new light on the modern and ancient worlds through its advances in luminescence dating. The process is being used to provide exciting new insights into areas of great interest such as the dating of earlier climate change events and the human colonisation of Australia. “Our research is also helping investigations into a third controversial topic – the timing and cause of the mass extinction of Australian megafauna,” said Adjunct Professor Nigel Spooner. Luminesence dating measures radiation and energy absorption in samples to provide the age of events from a few months to hundreds of millennia. It’s become a critical tool in areas such as palaeontology, archaeology and the earth sciences. 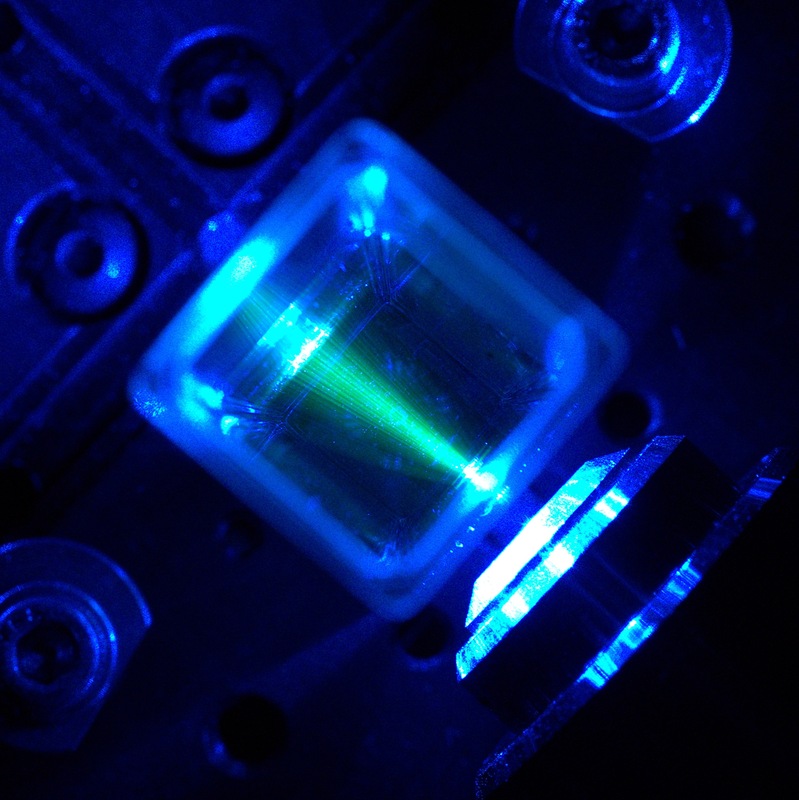 “The work of our lab is helping to better understand the physics of luminescence to provide even greater accuracy and extend its use in other novel applications,” Nigel said. Technology developed to identify bacteria in hospitals has been adapted by IPAS and the Adelaide Proteomics Centre to assist the local brewing industry in improving quality control practices. Beer contaminated by spoilage microorganisms can cost brewers thousands of dollars for expensive recalls and cause immeasurable damage to brand reputation. Dr Florian Weiland said IPAS was using mass spectrometry profiling as a rapid and cost-effective way of identifying spoilage yeast and bacteria during routine testing at various stages of beer production. 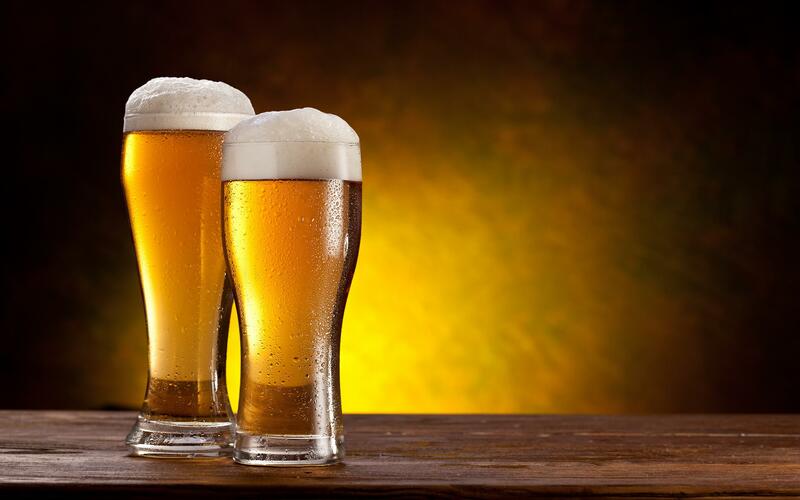 “While beer-spoilage microorganisms are harmless to human health, they produce off-flavours in the beer. This technology allows smaller breweries to conduct more extensive testing of their products that would otherwise be cost-prohibitive,” he said. IPAS has been working with Coopers Brewery to further develop the technology and is also involved in a separate initiative with Mismatch Brewing Co, The Hills Cider Company, Ashton Valley Fresh and Adelaide Hills Distillery. Other microbrewers and small-batch beverage companies can also have samples tested using a fee-for-service program. “Eventually we want to expand the technology for the broader SA food industry, particularly dairy and smallgoods producers,” said Florian. A super-sensitive laser system dubbed an optical dog’s nose is being developed by IPAS scientists to ‘sniff out’ disease in a person’s breath. 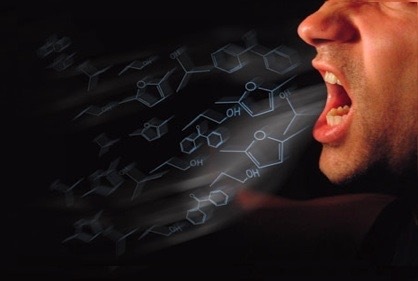 The optical frequency comb analyses breath molecules to detect evidence of disease before any external symptoms are showing. “Breath analysis is a relatively new field with studies around the world demonstrating that diseases such as lung and oesophageal cancer, asthma and diabetes can be detected in this way,” said IPAS Director Professor Andre Luiten. The technology being developed by IPAS sends up to a million different light frequencies through each molecule to reveal its unique molecular fingerprint. “The system could lead to broadscale health screening because it can test for a range of molecules at once and offers almost instant results,” said Andre. The team hopes to have a working prototype within two years and a commercial product by 2020. 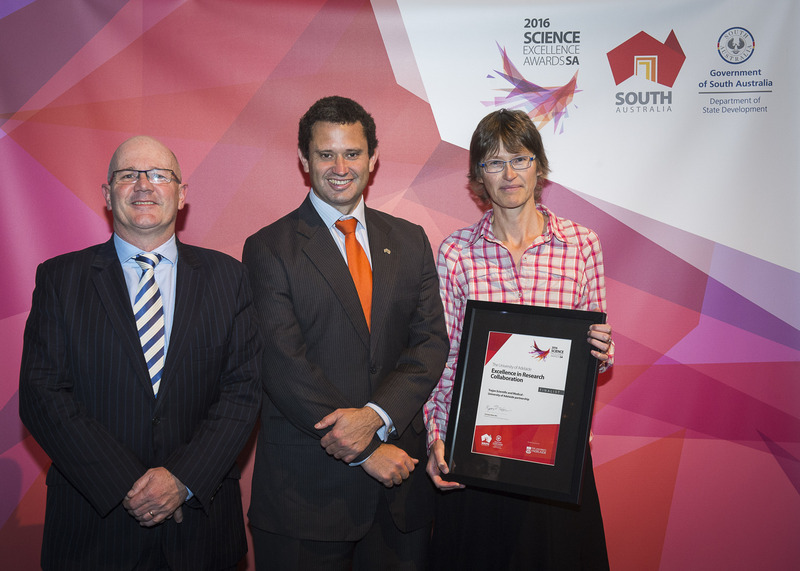 Andre thanked the SA Government for supporting the project through the Premier’s Research and Industry Fund. Scientists at IPAS have played a key role in proving the existence of gravitational waves, ripples in the fabric of space-time first predicted by Albert Einstein a century ago. The technological triumph earlier this year is sweet success for Associate Professor Peter Veitch, the University’s Head of Physics, who has spent most of his working life trying to detect these elusive waves. 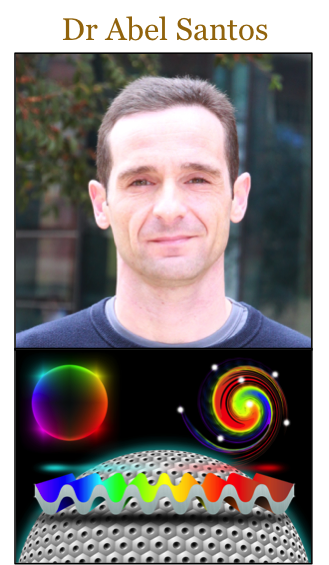 Peter was part of an IPAS team that provided support for the international LIGO Scientific Collaboration. 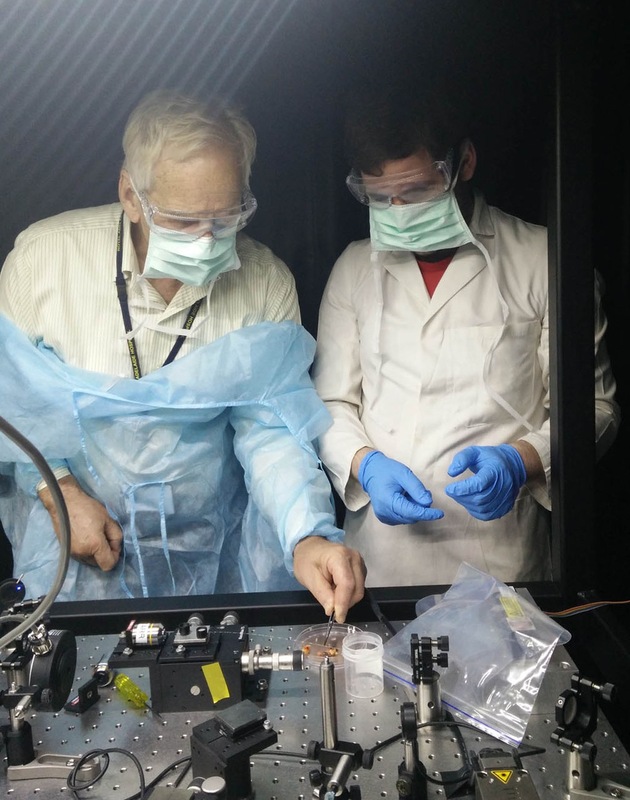 IPAS researchers developed ultra-high precision optical sensors to correct the distortion of laser beams within the Advanced LIGO detectors. 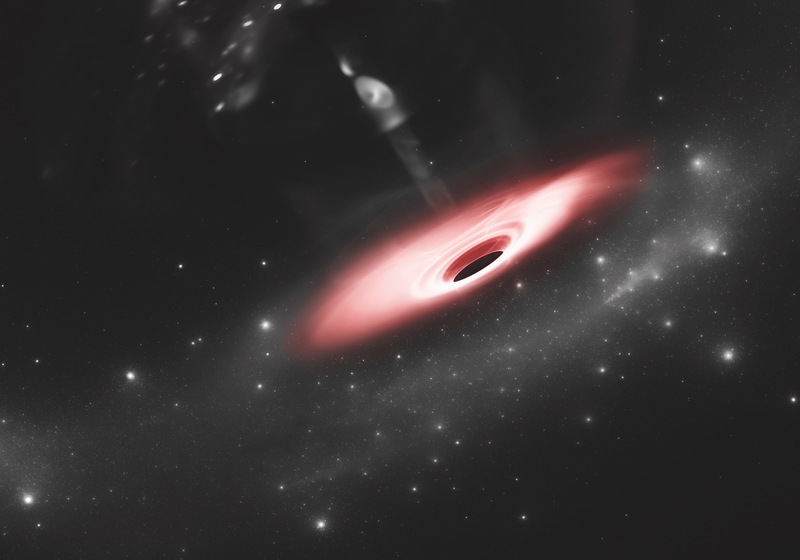 This enabled the high sensitivity needed to detect minute signals produced by the cataclysmic merger of two black holes more than one billion years ago. “I’ve spent nearly 40 years working towards this detection which could lead to dramatic changes in our understanding of the universe and its evolution,” said Peter. Portable gold detection equipment 100 times more sensitive than existing technology has been developed by an IPAS research team.Using light in two different processes – fluorescence and light absorption – researchers have shown they can detect minute traces of gold in water at less than 100 parts per billion. The technology will allow exploration companies to test for gold on-site at the drilling rig with much greater accuracy and speed. “The presence of gold deep underground is estimated by analysis of rock particles from exploration drill holes but when it’s in very low concentrations that’s extremely challenging,” said post-doctoral researcher Dr Agnieszka Zuber. The easy-to-use IPAS sensor aims to deliver a result within an hour at much lower cost. The research is funded by the Deep Exploration Technologies Cooperative Research Centre and the technology is currently being tested on rock samples with promising results. 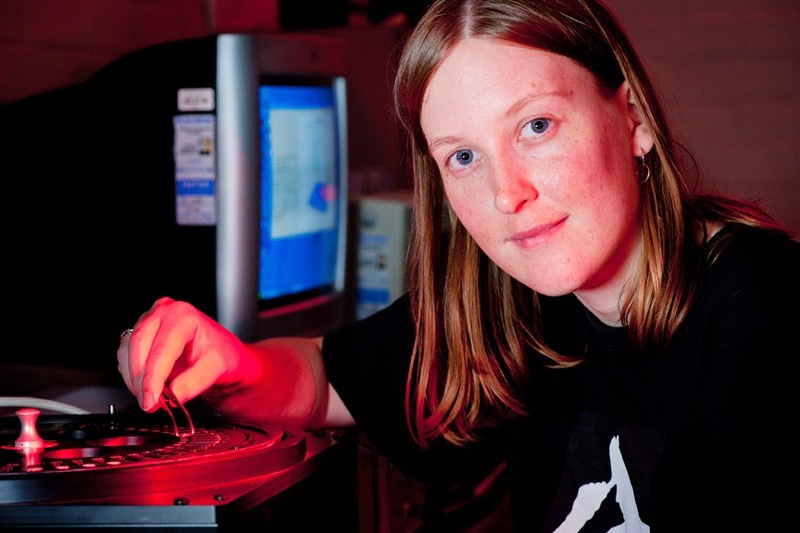 Ms Tess Reynolds and the Advanced Materials collaboration between IPAS and the defence industry has been featured as part of the Defence SA Research and Development Strengths website. 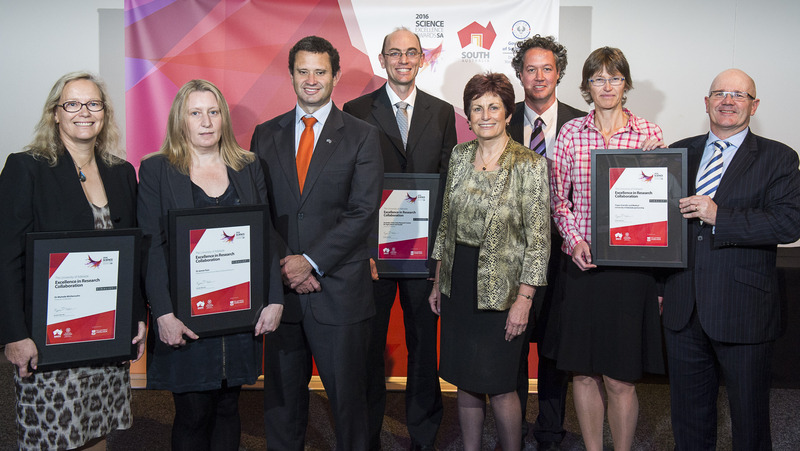 “South Australian researchers have a strong culture of cross-university, industry and Defence Science and Technology (DST) Group collaborations in Australia and internationally. 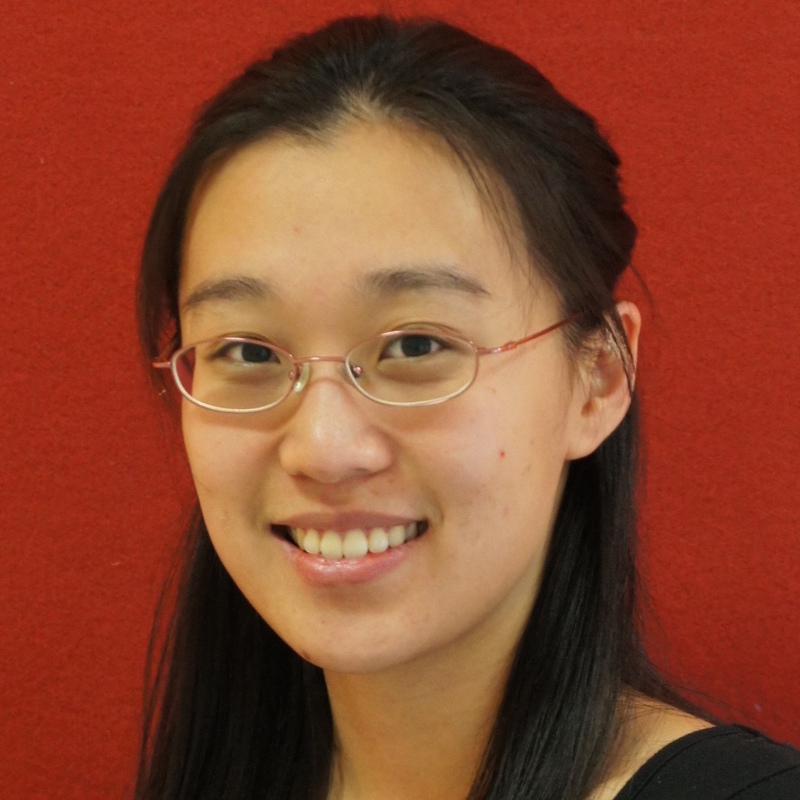 Dr Mandy Leung has been awarded a prestigious Postdoctoral Fellowship by the Japanese Society for the Promotion of Science (JSPS) to study micro- and nano-fluidics at the Okinawa Institute of Science and Technology. Mandy completed her PhD in Chemistry under the supervision of A/Prof Tak Kee in 2015. Congratulations to Mandy and we wish her all the very best in her upcoming fellowship.